Recovery Toolbox for OneNote (Download) is one of the latest additions to the company's growing collection of ultra-compact and highly efficient recovery tools for a wide range of Microsoft products. 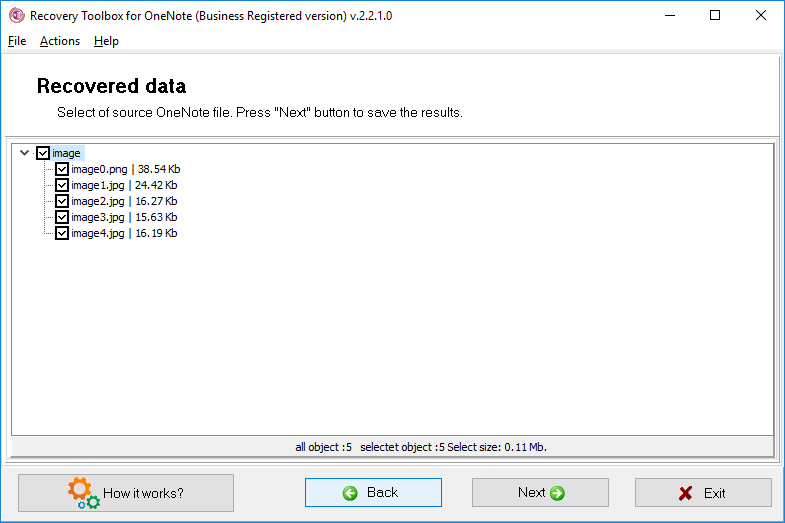 This new tool will help you recover data from damaged Microsoft OneNote files format. The product was created with ease of use and speed of operation in mind, which makes it a perfect tool for a very wide general audience with little to no data recovery experience. The developers of the program focused on simplifying the interface of the program to the greatest possible extent and making it completely self-explanatory. However, this guide contains a detailed overview of the recovery process and the steps you need to take to restore data from a corrupted .ONE file. Please refer to this document prior to using the program or contacting technical support with an issue report. Should Recovery Toolbox for OneNote appear incapable of retrieving your notes, feel free to use the Send source file command from the main program menu. The software will attach the current file to a new email message (using the default email client) and send it directly to the program developers. Once the file is received by the company's technical support team, they will attempt to recover your data and will use this opportunity to improve the program's recovery engine and algorithms. They will get in touch with you as soon as possible with an update on the results of their effort. Note that the recovery process may take some time - larger notes files will take longer to analyze and process, especially on slower CPU's. Please find below a detailed usage guide for Recovery Toolbox for OneNote. Please read it attentively before using the program - it provides answers to the majority of typical questions about the program. Should you still have questions about Recovery Toolbox for OneNote, please do not hesitate to contact our support department. We will be glad to assist you with your problem. Once the damaged OneNote file has been selected, you can proceed to the next step by clicking the Analyze button at the bottom of the program window. The program will prompt for a confirmation and will move forward once it's received. This step of the wizard is almost completely automated. 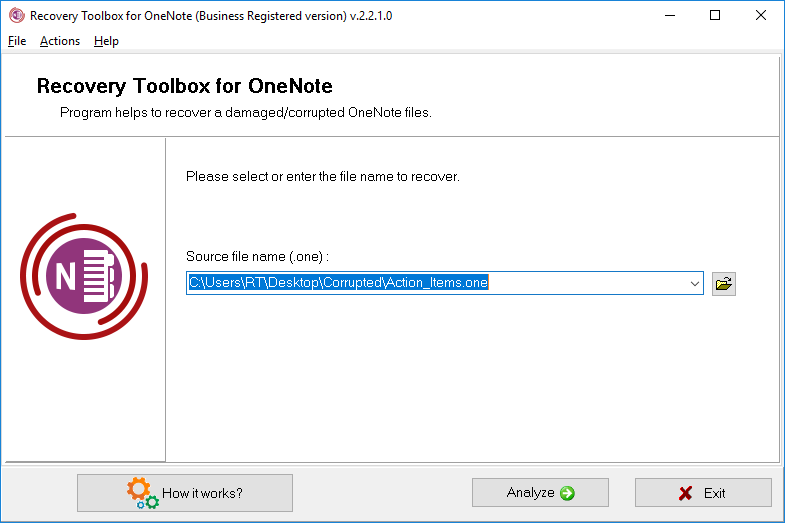 Recovery Toolbox for OneNote will scan the structure of the selected notes file and show a list of images it has managed to identify as recoverable. Their quantity and total size are shown under the list. You can check/uncheck items on the list manually or use the Check All / Uncheck All commands from the popup menu that appears when you right-click anywhere on the list. Once you've made your selections, click Next to proceed to the next (and final) step of the process. At this point, you will need to specify the name and location of the output folder that will be used for storing the recovered data snapshots. Similarly to specifying the name of the damaged file, this selection can be made in one of the three ways (see above). Please note that the DEMO version DOES NOT save recovered files. To remove this limitation, please purchase the full version of the program. 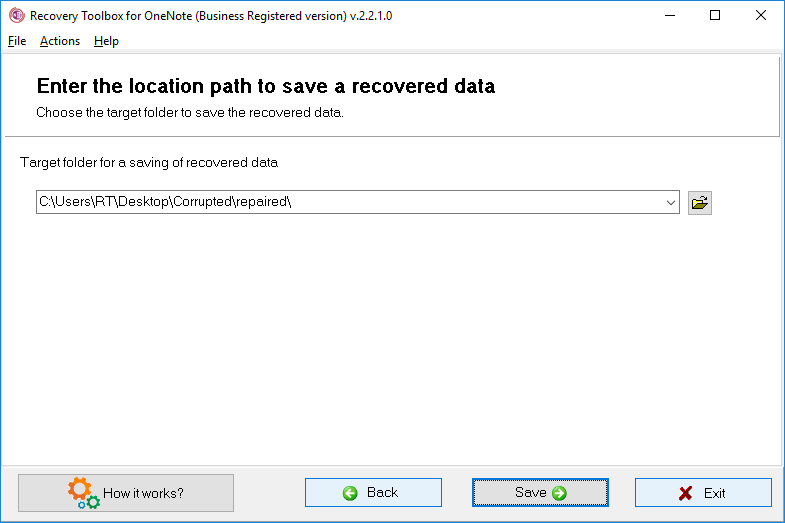 Once the files have been recovered and saved to the specified destination folder, Recovery Toolbox for OneNote shows a summary screen with detailed information about this recovery session. You can now quit the program by clicking the Exit button or go back to the file selection step using the Back button. You can now navigate to the specified output folder and view your files. As shown in the example, Recovery Toolbox for OneNote employs a 1-2-3 approach to recovering data. If, however, you still need assistance with recovering your OneNote data, please don't hesitate to get in touch with us - we'll respond as soon as possible!